Pavlova was created and named in honour of the Russian prima ballerina when she toured New Zealand and Australia in 1926 and again in 1929. There have been various claims as to the recipe having earlier origins in both Germany and the US. Essentially when I look at a Pavlova I think 'tutu' and 'light-as-a-feather'. I also wanted something to remind me of a Swan Lake tiara, which incidentally I made from scratch for a costume. You can find the link if you are interested at the bottom of this page. In mini version these are a cross between a Pavlova and a meringue nest and there is something rather wonderfully decadent in being able to eat one in just a few bites! 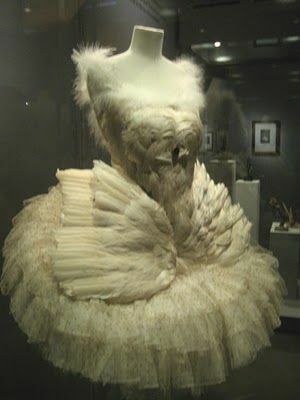 Left is a Swan aka Dying Swan costume worn by Anna Pavlova in the four minute ballet choreographed by Mikhail Fokine and first performed in St Petersburg in 1905. It was captured on film in 1925 and is on YouTube! This solo was later influential in interpretations of Odette in Swan Lake. For assembling the Pavlova, I used fresh seasonal fruit from our garden or fruit given by friends. Where the fruit is over-ripe I advise making, as I have here in the case of the raspberries, a compote or purée. This is because otherwise the fruit will be too juicy and therefore too soggy for the recipe. This is of particular importance of course, if you are making and assembling these in advance for a party. All I have done is to add a little sugar to the fruit and then reduce the water content by heating it to thicken it. In the case of purée, when the fruit is really juicy, I have mashed the fruit in situ and thus allowed for more water to be removed in the cooking. Whisk the egg whites until very stiff and dry. Whisk in half the sugar and continue until the mixture is stiff and shiny (see photo left). Gently fold the rest of the sugar and the lemon juice into the meringue. Place spoonfuls of meringue on baking paper, lightly brushed with coconut oil. Using a teaspoon gently open up the centre of each meringue to create a nest shape. You can if you wish make a flat circle of meringue and then build up the sides of the 'nest' with a piping bag. These meringues cooked in 20 minutes but I like meringues crisp on the outside and chewy within. Also many people cook their meringues at two temperatures i.e. 5 minutes at 180°C or 350°F and then turn down the oven to 120°C or 250°F for a further 20 minutes. Using a wood cooker with residual heat in the cast iron body, I don't have that sort of immediate temperature loss, so I chose an intermediate temperature and it worked. Store the meringues in an airtight tin until needed. Cream and fruit are the traditional fillings for Pavlova and in particular passion fruit. I used one big heaped teaspoon of cream per Pavlova. 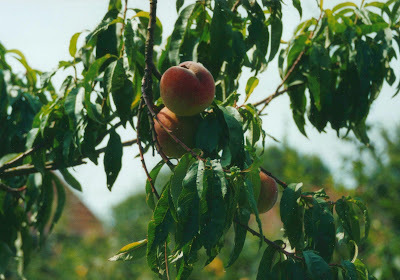 For the fruit I chose from what I had to hand, peaches, apricots and raspberry. The cream I use is raw it comes from our local organic pastured Normandie rare breed dairy and if you are interested we got up at dawn one morning and filmed the morning's milking and helped make the cream. We stopped drinking pasteurised milk some years ago and we fetch it from the farm once a week and freeze it. The cream lasts fine, that is if there is any left but you can freeze it as well (see link below).